Microsoft wants to build a better mobile phone through its acquisition of Nokia’s mobile phone business. One way it hopes to do that? By improving its maps applications to better compete against Google’s. “An effective alternative to Google,” and “more than one digital map of the world” is needed, Microsoft said in a presentation on the strategic rationale for the deal, which was posted to the company’s website. Microsoft will acquire several new mapping and location services as part of its acquisition of Nokia’s Devices & Services business, announced Monday. Chief among them are Nokia’s HERE Drive, HERE Maps (shown above) and HERE Transit. All three were designed to help people travel more efficiently and reduce carbon emissions in the process. HERE Transport was geared toward public transportation, offering public transportation route planning in hundreds of cities around the world, according to the Nokia Apps & Services landing page. HERE Maps and HERE Drive, meanwhile, were designed to help people in cars “plot the most optimal route to their destination,” Nokia said. 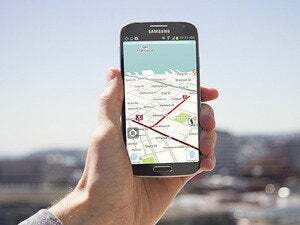 The three mapping apps were made available for all Windows 8 smartphones in July. Microsoft’s Bing search engine already offers mapping services such as public transportation routes. And last year, Bing grew the number of indoor places indexed by its Venue Map product in the U.S. and internationally, through a partnership with Nokia. Through the Nokia acquisition announced Monday, Microsoft “gets [the] flexibility to integrate HERE with other experiences,” the company said. Microsoft declined to comment on how exactly Nokia’s mapping services might be integrated into other Microsoft products, or which products. The acquisition gives Microsoft rights equivalent to ownership for the HERE mapping apps, Microsoft said on its website, noting that Nokia will continue to improve the apps for other platforms. “Geospatial” imagery and location services, and mapping, are “essential to integrate for mobile,” Microsoft said. Google is a dominant player in mapping and location services. It is continually improving its Maps app too—most recently through adding real-time traffic reports. Those features and others came following the company’s acquisition of the crowdsourced mapping app developer Waze. The U.S. Federal Trade Commission launched a probe in June into possible antitrust issues related to the Waze acquisition. Google could not be immediately reached to comment on Microsoft’s mapping plans. Apple is also looking to become a stronger competitor in mapping services. The company reportedly acquired app developer Embark late last month. Embark makes a mobile mapping app to help people navigate mass transit systems, similar to how Nokia’s HERE products work.